Hello everyone, new to the site and hopefully a new tractor owner soon. I am looking to purchase a new subcompact tractor. Trying to do reasearch to make a decision on what tractor to buy (now more confused than ever by my reaserch). I have 4 acers woods and grass with hills. Looking to do light to medium duty work with snow removal. Any suggestion and manufacture. I'm looking at Kioti, Branson, Mahindra. All seem to have good value for the buck. Any and all suggestions are welcome. Andy, unlike cars there really aren't any "lemon" tractors, so the brand doesn't matter as much. What's more important is that within a given make, you get the specific model and attachments to suit your present and future needs. Especially if you are new to tractors, you will need support: parts, service, manuals, ongoing advice. And you're not going to get these at your local hardware store or service garage. Bottom line: find a tractor dealer who's close by, well stocked, and reliable. The right dealer is more important than the right make. I agreee with Auerbach on staying local, but I would limit my selection to a major brand, Deere or Case/IH/Ford/Hew Holland. They will cost more but you can be assured that parts and service will always be available. The Sub-Compacts can limit your attachments for the three point hitch, they'll have a category "0", they don't have as big a selection as category one three point hitch equipment. I'd suggest going a bit bigger to get the category one three point. The two most used attachments I have are the front end loader and the three point hitch box blade. Not only is the box blade a real usefull tool it also acts as a counterballance for the loader. Frank. I agree with Frank on this one....stay with a major brand. It will be a bit more expensive, but especially in these times, well worth it. Not there are any guarantees that any one of the major brands can't fail (consider our own domestic car mfg's) but it is much less likely JD, Kubota, NH will fail in this economy than those you are considering. This economic downturn will claim many victims around the globe before it is over. Now, more than ever, stay with the majors....you will have a much better chance of picking a winner that will have long term dealer support and future parts availability. Unlike a car purchase, you are much more likely to own a tractor for many years, so one needs to consider long-term viability much more carefully. I didn't intentionally leave Kuboat out, just was typing faster than I was thinking. 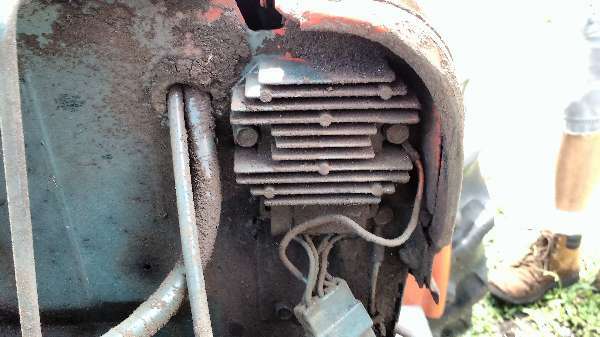 Just as an example on parts availabilty for domestic brands I have two "H" Farmalls and a "Cub" Farmall, all over sixty years old that still have parts available thru Case/IH. Let me add: for your hills and snow work, insist on 4WD. Decide the tire tread: "ag" for somewhat better traction, "turf" for mowing. I wouldn't consider any engine other than diesel. Find out where to get road-tax-free fuel. If you have cold winters, include a block heater. Focus on attachments. Except for towing, tractors don't do any work; they just transport the attachments for you, usually rear-mounted. You can get them any time but the more you include at the outset the better the deal. The dealer can advise you. A rear blade won't move earth like a box-blade, but it can smooth out loose soil, it moves snow, and costs little. The exception to getting attachments later is the front loader (costly but versatile). You want that attachment to already be on the machine before you accept it. Include in the deal a thorough session on safely operating and maintaining everything, delivery, one 1-hour service call, and a few years' worth of expendables like filters. Last comment on your first tractor. A car has a design life of 10-15 years. With a tractor it's closer to 50, and it holds its value. So choose right, and take care of it.